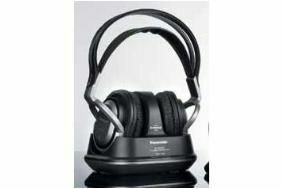 Panasonic RP-WF950H review | What Hi-Fi? Panasonic might know a thing or two about plasma TVs and Blu-ray players, but it's rare that a pair of its headphones gets us excited. And the RP-WF950Hs don't buck that trend. You get a simple transmitter/charger unit that sends RF signals up to 100 metres to the basic-feeling wireless cans. Unfortunately, no matter which of the three channels we used, and no matter where we tested it, the system produced a disappointing level of background hiss. That's often masked, but in quieter moments it's very distracting. It's a shame, because otherwise, the sound is fairly decent. Bass may not be particularly well defined or deep, but the overall presentation is fairly tonally balanced, and although there's no great abundance of detail or dynamics, the '950Hs are respectable in these regards. There's even a surround mode that, while certainly not for everyone, adds an extra degree of space and immersion that some gamers and action movie fans might enjoy.